CAMDEN, Ark. 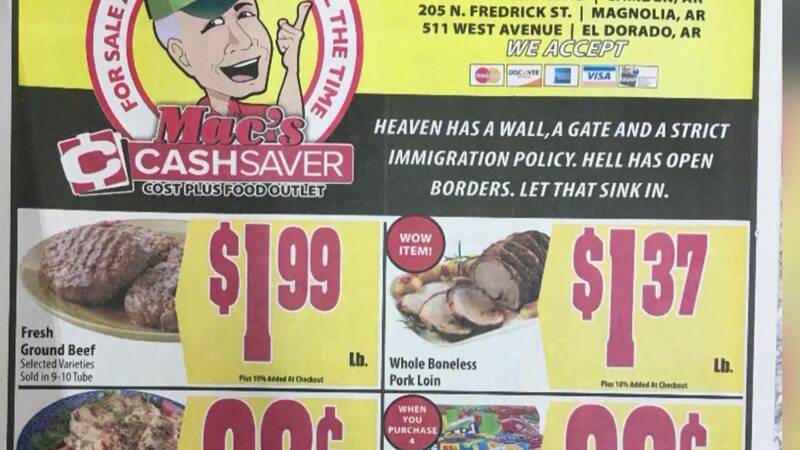 - A recently published Arkansas grocery store ad refrences a border wall. The message reads, "Heaven has a wall, a gate and a strict immigration policy. Hell has open borders. Let that sink in." Customers and people who saw the ad online are calling Mac's Cash Saver's store manager, Jack Digby, to express their disapproval. "They're just making a political spin out of it and getting the wrong idea of what it really means," said Digby. The store is doing what it can to keep customers coming back. The ad mailers were also sent out to several Cash Saver stores in Lousiana. The company said it stands by the message and plans to keep putting them out every week.